Coordonnateurs : Martínez-García Amalia, Furlong Cosme, Barrientos Bernardino, Pryputniewicz Ryszard J. 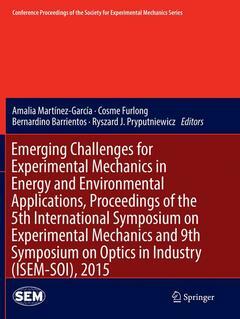 This book contains papers of the 5th International Symposium on Experimental Mechanics (5-ISEM) and the 9th Symposium on Optics in Industry (9-SOI), whose general theme is Emerging Challenges for Experimental Mechanics in Energy and Environmental Applications. These symposia are organized by Centro de Investigaciones en Optica (CIO) and Mexican Academy for Optics (AMO), under the sponsorship of the Society of Experimental Mechanics (SEM) and other national and international Organizations; Symposia are interdisciplinary forums for engineers, technicians, researchers and managers involved in all fields of Optics, Opto-mechatronics, Mechanics and Mechanical Engineering. Optical Imaging through Horizontal-Path Turbulence: A New Solution to a Difficult Problem.- Aluminum Strain Measurement by Beam Propagation.- The Technique of Laser-Induced Breakdown Spectroscopy for Determination of Heavy Metals in the Receiving Body of Water.- Applications of Laser Induced Breakdown Spectroscopy in the Identification of Bacteria.- Residual Stresses Measurement by the Hole-Drilling Technique and DSPI using the Integral Method with Displacement Coefficients.- On the separation of complete triaxial strain/stress profiles from diffraction experiments.- Quantification of slow mechanical displacements in metal samples by optical polarization phase shift DSPI.- Comparative analysis of optoelectronic properties of glucose for non-invasive monitoring.- Phase Shifting Interferometry using a coupled cyclic path interferometers.- Identification of microorganisms using digital holographic microscopy.- Noise reduction in off-axis digital holography reconstruction from two reconstruction distances based on Talbot effect.- Study of temperature distribution over a Stirling engine by using the Schlieren technique.- On Axis Fringe Projection.- Instrument for recording Purkinje images.- Ultrasonic Arc Maps and its potential application in non-destructive testing.- Phase-shifting generated by wavelength modulation by means of switching on-off a laser diode.- Index refraction measurements in liquid substances of full field using holographic interferometry.- Geometrical thickness measurement of thin films by a transmitted Gaussian beam.- Topography and color study of an object using fringe projection and colorimetry techniques.- Temperature measurement of a synthetic jet produced by a Helmholtz cavity.- Gates’ interferometer as fringe projection system for recovering 3D shapes.- Development of an automated Laser Induced Breakdown Spectroscopy system for compositional mapping of surfaces.- Artificial visual system used for dental fluorosis discrimination.- Inspection of Laser Ablated Transparent Conductive Oxide Thin Films by a Multifunction Optical Measurement System.- LIBS technique for identification of crude oils.- 3D Displacement Distribution Measurement Using Sampling Moire Method with Multiple Cameras.- Automatic Generation of Codes for Routine of CNC Machining Based on Three-Dimensional Information Obtained by Fringe Projection.- Automatic Generation of Movement Sequences to Robotic Arm Based on Three-Dimensional Data Obtained through Fringe Projection Technique.- Application of optomecatronic load cell for measuring work force and efforts in industrial machinery.- ASE Noise Attenuation for Signal at 1548.4 nm throught a Sagnac Interferometer using High-Birefingence Fiber which is Subjected to Temperature Changes.- Single-shot Phase shifting interferometry for microscopic measurements of non-birefringent transmissive phase samples.- Design of a customized myoelectric hand prosthesis.- Finite element static analysis simulation for a grain dispenser mechanism.- Controlling Bounce of Vacuum Circuit Breakers’ Contacts.- Experimental and Numerical Investigation of Effects of Fiber Orientation of Wood Stiffness.- Auto-calibration and micro-flow injection procedure based on automated hydrodynamic system for spectrophotometric determination of cobalt.- Mathematical Model to Predict the Stress Concentration Factor on a Notched Flat Bar in Axial Tension.- Mechanical implementation of Kinematic Synergy for multi-point grasping.- Cascaded ultra-low reflective fiber points for distributed sensing.- Object surface representation via NURBS and genetic algorithms with SBX.- Photo-Oxidation of Polystyrene Film Irradiated With UV-B.- Dynamic analysis of trawl doors applied in bottom trawls to catch shrimp.- Simulator of an Adaptive Optics System Using Matlab.- Design, development and validation of an Artificial Muscle Biomechanical Rig (AMBR) for Finite Element model validation.- Application of laser light on the development of equipment for the study of proteins.- Organic Solar Photovoltaic cells.- Fiber Bragg Gires-Tournois interferometer etalons as fiber sensor.- Cleaning of Tantalum capacitor electrode surface by laser in multipulse regime.- High quality polishing procedure of glass substrates: application in integrated optics.